the process of VMX interrupt/exception injection. A guest VM never owns any physical interrupts. All interrupts received by Guest OS come from a virtual interrupt injected by vLAPIC, vIOAPIC or vPIC. Such virtual interrupts are triggered either from a pass-through device or from I/O mediators in SOS via hypercalls. Section 3.8.6 introduces how the hypervisor manages the mapping between physical and virtual interrupts for pass-through devices. Emulation for devices is inside SOS user space device model, i.e., acrn-dm. However for performance consideration: vLAPIC, vIOAPIC, and vPIC are emulated inside HV directly. From guest OS point of view, vPIC is Virtual Wire Mode via vIOAPIC. The symmetric I/O Mode is shown in Figure 96 later in this section. Kernel boot param with vIOAPIC: add “maxcpu=1” (as long as not “0”) Guest OS will use IOAPIC. And Keep IOAPIC pin2 as source of PIC. The vCPU request mechanism (described in Pending Request Handlers) is leveraged to inject interrupts to a certain vCPU. As mentioned in IPI Management, physical vector 0xF0 is used to kick VCPU out of its VMX non-root mode, used to make a request for virtual interrupt injection or other requests such as flush EPT. The vcpu_make_request is necessary for a virtual interrupt injection. If the target vCPU is running under VMX non-root mode, it will send an IPI to kick it out, which leads to an external-interrupt VM-Exit. For some cases there is no need to send IPI when making a request, because the CPU making the request itself is the target VCPU. For example, the #GP exception request always happens on the current CPU when it finds an invalid emulation has happened. An external interrupt for a pass-thru device always happens on the VCPUs this device belonging to, so after it triggers an external-interrupt VM-Exit, the current CPU is also the target VCPU. LAPIC is virtualized for all Guest types: SOS and UOS. Given support by the physical processor, APICv Virtual Interrupt Delivery (VID) is enabled and will support Posted-Interrupt feature. Otherwise, it will fall back to legacy virtual interrupt injection mode. These APIs will finish by making a request for ACRN_REQUEST_EVENT. Get a deliverable virtual interrupt from irr to isr. Transition ‘vector’ from IRR to ISR. This function is called with the vector returned by ‘vlapic_find_deliverable_intr()’ when the guest is able to accept this interrupt (i.e. RFLAGS.IF = 1 and no conditions exist that block interrupt delivery). Find a deliverable virtual interrupts for vLAPIC in irr. The vector does not automatically transition to the ISR as a result of calling this function. vecptr: Pointer to vector buffer and will be filled with eligible vector if any. false: There is no deliverable pending vector. true: There is deliverable vector. vcpu_id_arg: ID of vCPU, BROADCAST_CPU_ID means triggering interrupt to all vCPUs. lvt_index: The index which LVT would to be fired. -EINVAL: on error that vcpu_id_arg or vector of the LVT is invalid. Inject MSI to target VM. -1: on error that addr is invalid. Get physical address to PIR description. If APICv Posted-interrupt is supported, this address will be configured to VMCS “Posted-interrupt descriptor address” field. EOI virtualization is enabled if APICv virtual interrupt delivery is supported. Except for level triggered interrupts, VM will not exit in case of EOI. In case of no APICv virtual interrupt delivery support, vLAPIC requires EOI from Guest OS whenever a vector was acknowledged and processed by guest. vLAPIC behavior is the same as HW LAPIC. Once an EOI is received, it clears the highest priority vector in ISR and TMR, and updates PPR status. vLAPIC will then notify vIOAPIC if the corresponding vector comes from vIOAPIC. This only occurs for the level triggered interrupts. LAPIC passthrough is supported based on vLAPIC, after switch to x2APIC mode. In case of LAPIC passthrough based on vLAPIC, the system will have the following characteristics. most MSRs are directly accessible from Guest VM except for XAPICID, LDR and ICR. Write operations to ICR will be trapped to avoid malicious IPI. Read operations to XAPIC and LDR will be trapped in order to make the Guest VM always see the virtual LAPIC IDs instead of the physical ones. vIOAPIC is emulated by HV when Guest accesses MMIO GPA range: 0xFEC00000-0xFEC01000. vIOAPIC for SOS should match to the native HW IOAPIC Pin numbers. vIOAPIC for UOS provides 48 Pins. As the vIOAPIC is always associated with vLAPIC, the virtual interrupt injection from vIOAPIC will finally trigger a request for vLAPIC event by calling vLAPIC APIs. Set vIOAPIC IRQ line status. Similar with vioapic_set_irqline_lock(),but would not make sure operation be done with ioapic lock. vPIC is required for TSC calculation. Normally UOS will boot with vIOAPIC and vPIC as the source of external interrupts to Guest. On every VM Exit, HV will check if there are any pending external PIC interrupts. vPIC APIs usage are similar to vIOAPIC. ACRN hypervisor emulates a vPIC for each VM based on IO range 0x20~0x21, 0xa0~0xa1 and 0x4d0~0x4d1. Set vPIC IRQ line status. Get pending virtual interrupts for vPIC. Accept virtual interrupt for vPIC. during instruction emulation, an instruction fetch may access a non-exist page from rip_gva, at that time a #PF need be injected. This exception may be injected immediately or later, depends on the exeception class. vector_arg: Vector of the exeception. err_code_arg: Error Code to be injected. -EINVAL: on error that vector is invalid. Inject external interrupt to guest. Inject general protection exeception(GP) to guest. err_code: Error Code to be injected. Inject page fault exeception(PF) to guest. addr: Address that result in PF. Inject invalid opcode exeception(UD) to guest. Inject alignment check exeception(AC) to guest. Inject stack fault exeception(SS) to guest. 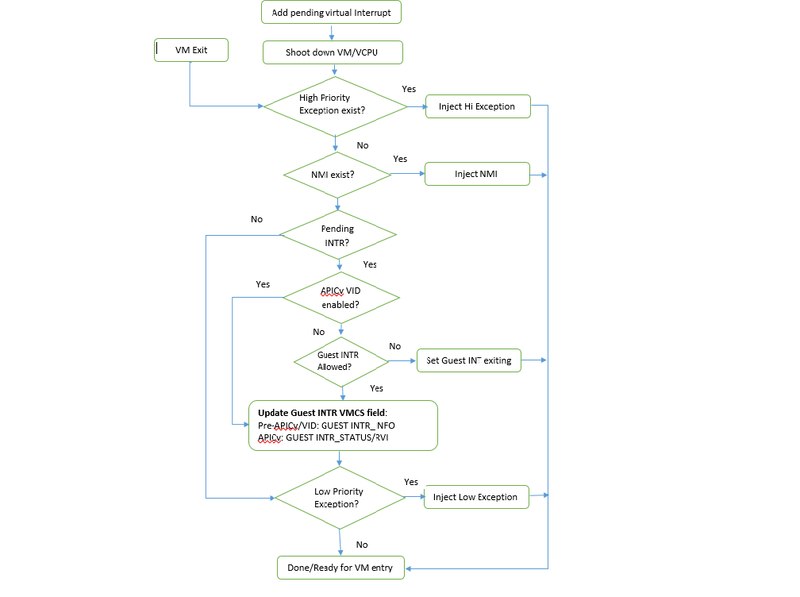 ACRN hypervisor uses the vcpu_inject_gp/vcpu_inject_pf functions to queue exception request, and follows SDM vol3 - 6.15, Table 6-5 to generate double fault if the condition is met. The source of virtual interrupts comes from either DM or assigned devices. For SOS assigned devices: as all devices are assigned to SOS directly. Whenever there is a device’s physical interrupt, the corresponding virtual interrupts are injected to SOS via vLAPIC/vIOAPIC. SOS does not use vPIC and does not have emulated devices. See section 3.8.5 Device assignment. For UOS assigned devices: only PCI devices could be assigned to UOS. Virtual interrupt injection follows the same way as SOS. A virtual interrupt injection operation is triggered when a device’s physical interrupt occurs. For UOS emulated devices: DM (acrn-dm) is responsible for UOS emulated devices’ interrupt lifecycle management. DM knows when an emulated device needs to assert a virtual IOPAIC/PIC Pin or needs to send a virtual MSI vector to Guest. These logic is entirely handled by DM. Before APICv virtual interrupt delivery, a virtual interrupt can be injected only if guest interrupt is allowed. There are many cases that Guest RFLAGS.IF gets cleared and it would not accept any further interrupts. HV will check for the available Guest IRQ windows before injection. NMI is unmasked interrupt and its injection is always allowed regardless of the guest IRQ window status. If current IRQ windows is not present, HV would enable MSR_IA32_VMX_PROCBASED_CTLS_IRQ_WIN (PROCBASED_CTRL.bit) and VM Enter directly. The injection will be done on next VM Exit once Guest issues STI (GuestRFLAG.IF=1). There is no data structure exported to the other components in the hypervisor for virtual interrupts. The APIs listed in the previous sections are meant to be called whenever a virtual interrupt should be injected or acknowledged.